film festival | Life Is A Festival! The Adventure Travel Film Festival, which took place from 11-13 August 2017, had been on my to do list for a few years now and I finally managed to pay it a visit. It is a film festival showing mostly independently produced outdoor, adventure sports and travel documentaries combined with camping just a tube and a bus ride away from Central London at Mill Hill School. The annual event, which also has sister festivals in Scotland (September) and Australia (February), is run by adventurers and filmmakers Austin Vince and Lois Pryce and apart from the extensive film programme offers talks by well-known explorers, workshops (first aid on the road, medicinal plants, bushcraft, spoon whittling) and even motorbike trial lessons. I managed to make it to two of the three festival days, but even though the films were repeated at different times it was really difficult to choose between them as they all sounded really enticing. Some of them also had filmmaker Q&As at the end, like Liemba (a journey on Africa’s oldest steamship), whose director Julie Clavier came over from Paris to present her film. The first film I caught was called Man with a Pram and featured Swedish adventurer and now family man Mikael Strandberg who set out on a two-month walking journey from Manchester to London together with his two-year old daughter Dana and assistant Georgia Villalobos. Alternating between staying with friends and acquaintances and wild camping along the way, the three encounter an intriguing cast of characters, old and young, friendly and odd, on their journey to figuring out what the English are really like as a nation. Definitely one to watch if you think travelling with children is (nearly) impossible, just put them in a pram, pack some nappies and off you go! This was followed by a triple bill of shorter films: Kapp to Cape, a three-month high-speed cycle journey from Norway to South Africa by British Iranian Reza Pakravan; Two Bedouins, A Camel & An Irishman follows Leon McCarron and his local guide Musallem Faraj into the Sinai desert where they explore the fascinating landscape and learn about the traditional way of life of the nomads; In The Eyes of God Latvian extreme kayaker Tomass Marnics and a handful of his friends tackle the most dangerous rivers in remote Kyrgyzstan. Unlike at most other festivals I’ve been to, the venue provided all the food (and I’m assuming they don’t allow outside vendors), so if you’re planning on attending the whole festival, I highly recommend booking your meal plan in advance (this covered cooked breakfasts on Saturday and Sunday as well as dinners on Friday and Saturday night). As I wasn’t staying the whole weekend, I brought my own snacks and supplemented them with coffees and sandwiches from the indoor café (plus there was a BBQ, which included veggie kebabs and veggie sausages, for extra food options). Talking of practical things, there was a shower and toilet block not too far from the camping areas as well as portaloos and indoor toilets in the venues and plenty of drinking water available. I also picked some lovely blackberries right behind my tent, which made for a delicious foraged snack. After dinner, it was time to attend a talk and the one by native Sri Lankan Dylan Wickrama was very inspiring. He decided to tackle the Pan American Highway on his motorbike and build his own raft to cover the Darién Gap (where no road exists) between Central and South America, resulting in a 30-day solo boat journey (bike on board), which made for a profound experience, including meeting a pod of inquisitive dolphins. It was a beautiful story illustrated by videos and photos from the trip. As the weather was quite windy and cloudy on Friday night, the Starlight Screening, which would have normally happened outside, was moved to the sports hall with hundreds of chairs set up for us. The whole festival was efficiently run by the organisers and dozens of friendly volunteers like Kathy and James, who checked me in on Friday afternoon. The feature on Friday night was called DugOut and was a film by and about Ben Sadd and James Trundle, who ventured into the Amazon enlisting a local man to help them fell a tree, turn it into a dugout canoe and then take it downstream for a river adventure. The film is a beautifully made testament to what can be achieved when you have an idea, follow through with it and are open to learning from the locals thereby discovering a whole new world and skills which our Western societies have largely lost. After a lovely bluegrass live set by The Jolenes (including festival director and ace banjo player Lois Pryce) by the campfire on Friday evening and a peaceful night in the happy tent, the first sessions of the day started at 10am (sadly clashing with the morning yoga class). I picked the How to Make a Film of Your Adventure by festival director Austin Vince talk, who explained in an hour and a half the rules, pitfalls and ideas around making a TV-worthy travel and adventure documentary. So do remember to work with a shot list, vary your sequences (bits of story) and transitions (bits to link the parts of the story, i.e. maps, local flora and fauna, day counters with commentary and/or music), include children, older people and animals and aim to show interesting places, artefacts and experiences plus try and shoot only what you need. I also watched Paddle For The North, a Yukon canoeing adventure which, to my delight, included two puppies, Taiga (a golden retriever) and Zephyr (a wire-haired pointer), who made the already intriguing film even more fun to watch. I somehow managed to see a lot of water-based films during the weekend, another one was Rowed Trip describing Canadians Julie and Colin Angus’ seven months rowing and cycling trip from John O’Groats in Scotland all the way to Aleppo in Syria in 2008, particularly poignant to see given the current political situation. The final event I attended was a talk by explorer Benedict Allen who, together with BBC Security Correspondent Frank Gardener in his wheelchair (he was shot by terrorists), embarked on a quest to see Birds of Paradise in Papua New Guinea. It was another good example of how having a dream and following through with it is what adventure is all about. And this is what this festival is really good at. Inspiring people to turn their dreams into an adventure, learn from the experts and just go for it. But don’t worry, you don’t have to be an adventurous type to enjoy the event. In fact, the festival was definitely on the quieter side and is suitable for families, more laid-back folks (many of them into motorbikes) and anyone with an interest in travelling and filmmaking. It’s been my second year as a volunteer with VIFF (29 September – 14 October 2011) in a row and this time I managed to watch 45 films in two and a half weeks. Yep, sounds like a lot, but mind you, I met one volunteer who had actually seen 85 films including all the media screenings before the festival. The volunteer team was awesome again this year! I spent all my shifts at the info tent on Granville Street, giving film tips (i.e. movie therapist) and helping film goers find the right lineup (i.e. movie traffic warden). We had so much fun discussing which films were ‘must see’ this year and it was exciting to see lots of familiar faces from last year in the lineups. Once again, there way too many quality films to choose from. Some of my VIFF 2011 favourites included Cairo 678 and Position Among The Stars (which I had both seen at other festivals before), Cloudburst, Pure, Mitsuko Delivers, Give Up Tomorrow, Burma Soldier, Bone Wind Fire and The Girls in the Band. Having said that, every single person I met had different favourites. That’s what’s so fascinating about film festivals. You can create your own schedule and make it a learning experience, a visual trip around the world or simply a few evenings of quality entertainment. Just go and try it out. But be warned: film festivals are highly addictive! I love the creativity children bring to any event or process and volunteering with Reel 2 Real International Film Festival for Youth 2011 was a great example of it. The festival, which ran from 9 til 15 April 2011, brought together a variety of film-related activities for young people to enjoy, from watching movies and asking questions at the Q&As to taking part in hands-on animation workshops. During my first shift I assisted various little filmmakers with transferring their ideas for a short animation story into a stop-motion masterpiece. We used a setup with a camera and a laptop and within minutes the children created beautiful visual stories about ladybugs, snakes and other creatures which tended to get into all sorts of trouble. It’s great when kids get an opportunity to try out those kind of things (especially when it’s free of charge) and get inspired to develop their skills further as they grow up. Another event which was really inspiring was the Young Filmmakers Showcase, a roundup of some of the best short films made by teenagers and children as young as eight. The quality of the scripts, filming and acting in the selected films from filmmaking workshops all over British Columbia was astonishing. It was a proud moment for the little directors, actors and screenwriters to accept their awards while their parents and the rest of the audience gave them standing ovations. Who knows, in a couple of years it could be some of those kids making it in the big, bold filmmaking world. I really hope so! Sometimes I come across festivals that I would never really think of attending – if it wasn’t for the sake of this blog. 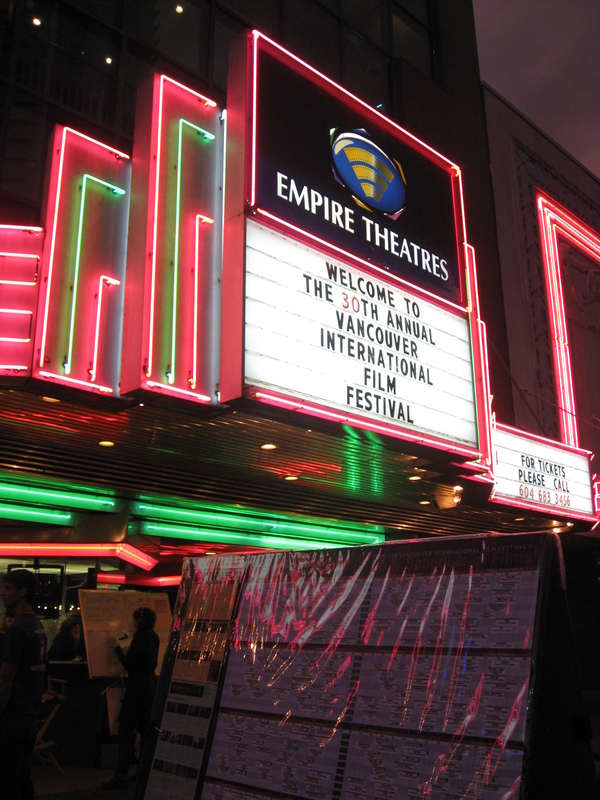 So when I heard about the International Fly Fishing Film Festival, which took place on 26 March, 2011, at the Vancity Theatre in Vancouver, I was excited to find out what it was all about. Compared to a lot of other film festivals I volunteer at it was not a nonprofit event, but basically a showcase of film excerpts, the dvds for which were on sale on the day. The festival is organised by a family business who also run Fly Fusion Magazine and were a really friendly bunch, so I ended up learning quite a bit about the sport throughout the day. For a free, fun and quick lesson on fly fishing, check out this hilarious video called Fly of My Dreams. I was also glad to see that while about 95% of the audience was made up of male fly fishing enthusiasts, there are also some very skilled female fly fishing pros around, such as April Vokey , who teaches workshops and co-presents Fly Nation TV. I’m not sure if my newly acquired fly fishing vocabulary (which includes the words spey casting, hackles and steelhead) will come in useful anytime soon, but after today I do feel quite tempted to give it a go myself sometime, even if just once.